Waffle makers, along with other appliances, have blessed the most of us. If you’ve went on without one, and intend to buy one eventually, you’ll soon know why. With each blessing comes a curse some say. What’s the curse to come with some waffle makers? They don’t have removable plates. Well, there’s two solutions, of which the both are a bit obvious. Resolution #1: go through the hassle of having no removable plates. Resolution #2: Get a waffle maker with removable plates.Over the course of this article, resolution 2 is all that will be written about. Removable plates don’t necessarily make waffle makers more expensive. Not always at least. T-fal EZ – Designed for 2 belgian waffles at a time. This waffle maker has no limits as it can even help with sandwiches! With lights that indicate whether the product is ready or not, you don’t need to worry about anything burning with supervision. The removable plates are dishwasher safe to make cleaning a whole lot easier. Hamilton Beach 26030 – With the option to make your waffles fluffy once flipped, you can ensure the maker makes your waffles just how you like ‘em. The handle will stay cold so you don’t get burned in the attempt to get your delights. It can easily be stored due to its handle and has a stainless steel exterior. The dip tray and removable plates make this a lot less messier than the alternatives! KRUPS GQ502D – Here’s where it gets advanced. 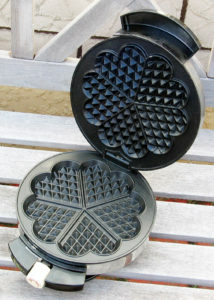 With a 4 slice belgian waffle maker and 5 different heating/browning levels. Stainless steel exterior, lights to indicate if your tasty waffles are ready, and an audible “ready” beep in case you missed the light. Though it’s not the most inexpensive option, it makes up for that with the fact that your waffles will be soft on the inside and a little crispy outside (if you wish). Black+Decker – Dishwasher safe detachable plates. What a rhyme. Make your waffles thick and fluffy with the Black+Decker; don’t worry about a mess either because they made sure the grids were non-stick. The cord can easily be wrapped with the “Built-in Cord Wrap” to prevent any potential damage. The handle will always be cool so the warmth of the grid won’t burn your hand when opening (thankfully). A good waffle maker for a good price.